Coursing Ability Tests – Go Gordons!!!! 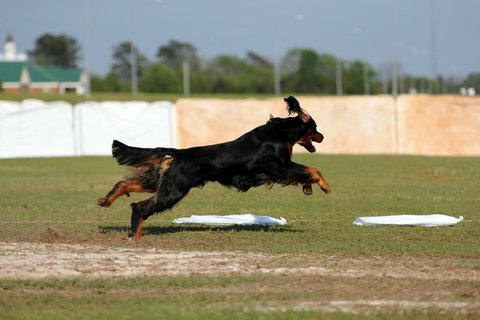 Diane tells us that she agrees wholeheartedly with Linda Stebbins who mentioned that one “needs to have a sense of humor to own this breed” (Gordon Setter). Diane does all of her own training and Flyball has been her forte for the last 16 years with Agility competition her second passion. She and her husband Bill are in their 30th year of owning Gordon Setters and she says they would not change to any other breed. 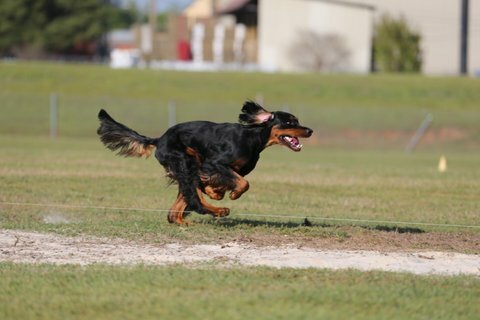 When I think of lure coursing “hounds” is what comes to mind, so seeing these photos and reading this article from Diane has been a great deal of fun for me, hope you enjoy it as much as I did. Be sure to send her a “thank you” for sharing her expertise with us on Coursing Ability Tests. If this entices you to get involved in Coursing Tests please be sure to share your experiences with us, the more the merrier you know! Coursing Ability tests are lure coursing trials for the non-lure coursing breeds. 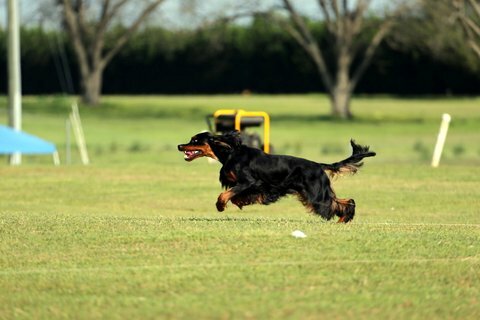 The course is set just like a regular lure coursing trial except the rules are different for the non-lure coursing breeds. There are 2 sets of courses…….300 yards for dogs 12 inches and under and 600 yards for dogs larger than 12 inches. The lure is 3 white trash bags attached to a rope on a pulley system. The dog and handler are brought to the start line with the trash bags about 20 feet in front of the dog. The judge yells “tally ho” and the chase begins. The dog is to chase the lure through many turns at many angles until it stops at the finish line. If your dog loses sight of the lure, you may run and help him find it as many times as he needs without touching him. The person will stop the lure until the dog gets back on track and then restarts the chase. The time allotment is 2 minutes for large dogs and 1 ½ minutes for small dogs to pass. It is a pass/fail system. You need 3 passes to obtain a title. Most tests are totally fenced but you would have to check with the host club. The dog must be at least 1 year of age. Previous PostEffective Solution for Ear InfectionsNext PostFlyball is Flipping Fun! Loved your photos and article, Diane. Yes, Gordons can do this event well. Thanks for sharing. Thanks Diane. A little basic knowledge about this sport may encourage others to give it a try. If anyone in the Gordon community is really interested, I would be willing to help or answer any questions on coursing.